Much has been written of late about what the apostle Paul really meant when he spoke of justification by faith, not the works of the law. This short study by Stephen Westerholm carefully examines proposals on the subject by Krister Stendahl, E. P. Sanders, Heikki R?is?nen, N. T. Wright, James D. G. Dunn, and Douglas A. Campbell. In doing so, Westerholm notes weaknesses in traditional understandings that have provoked the more recent proposals, but he also points out areas in which the latter fail to do justice to the apostle. Readers of this book will gain not only a better grasp of the ongoing theological debate about justification but also a more nuanced overall understanding of Paul. 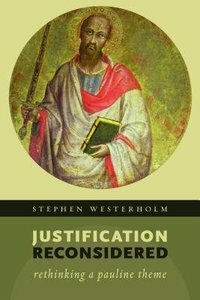 About "Justification Reconsidered: Rethinking a Pauline Theme"
Stephen Westerholm (D.Theol., Lund University) is professor of early Christian studies at McMaster University. He is the author of Understanding Paul, Perspectives Old and New on Paul, and Jesus and Scribal Authority.